A, HUB system display screen demonstrating surgical team on left (highlighted if checked in), procedural algorithm in the center (highlighted if completed), and progress bar on right. B, Example of an alert message displayed by HUB system secondary to omitted step. Conboy HM, Maron JK, Christov SC, et al. Process modeling of aortic cannulation in cardiac surgery: towards a smart checklist to mitigate the risk of stroke. Presented at: MICCAI International Conference on Medical Image Computing and Computer-Assisted Intervention; September 14, 2014; Boston, MA. The operating room is a common site for adverse events in the hospital, which are largely related to communication breakdowns and surgical flow disruptions leading to error cycles.1-4 To reduce the rate of preventable adverse events and enhance patient safety, we present what is, to our knowledge, the first clinical use of the HUB,5 a computer-assisted system designed to support intraoperative team performance. We designed a single-site, prospective pilot investigation to determine the feasibility of the HUB5 mobile workflow management system (3Si Systems LLC), which uses speech-recognition technology to support intraoperative team communication and adherence to best-practice guidelines. Based on prior audio recordings of 9 cardiac procedures, process models composed of major procedural steps were developed onto software and preloaded on the HUB preoperatively (Table). The HUB recognizes voice commands (derived from the audio recordings and specific to each team member) by key team members fitted with high-fidelity microphones (earpiece or clip-on) that correspond to procedural steps that initiate appropriate algorithms (Figure, A) or alert the team if inadvertently omitted (Figure, B). Functionality of the HUB was tested between May 2015 and March 2016 during 5 procedures: minimally invasive coronary artery bypass grafting, 2 conventional coronary artery bypass graftings, aortic valve replacement/coronary artery bypass grafting, and isolated aortic valve replacement. The primary outcome measured was the qualitative ability of the HUB to distinguish commands from conversational speech. The study was approved by the Veterans Affairs Boston Healthcare System institutional review board, and all research participants provided written informed consent. The HUB system registered key surgical team members using the phrase “check-in [team member name].” Collectively, 62 major steps and 216 subtasks were tested in the procedural algorithms. All task phrases were distinguished from conversational speech and recorded appropriately by the HUB; however, 62 steps required repetition before system acknowledgment. During the procedures, the potential for 3 errors occurred: 2 recommended surgical steps were omitted, and 1 communication loop was not closed. In each instance, the HUB appropriately displayed alerts, successfully prompting the surgical team to correct the errors. Surgical safety interventions often fail to account for the multidisciplinary nature of surgery. The HUB is designed to facilitate multidisciplinary team communication, recognize sentinel steps of high-consequence surgical procedures, and alert the operating room team to communication failures and procedural omissions. The feasibility test we present is encouraging and supports further intraoperative analysis of the HUB, particularly speech recognition, because standard Microsoft speech recognition software was used in this investigation and requires upgrade for a marketed system. Although false-step recognition did not occur in this investigation, future speech recognition software may use a command to prompt the system to distinguish commands directed toward the HUB from commands uttered in conversational speech. Furthermore, should an intraoperative complication occur, the HUB user can request a preloaded surgical checklist to assist with correcting the complication. This does not interfere with the procedure algorithm, although a pause function may be introduced. Although we tested the HUB in cardiac surgery, HUB algorithms can be developed and applied across all surgical specialties. 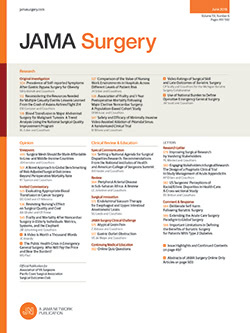 Unique algorithms can also be tailored for complex procedures involving multiple surgical teams, where communication is critical and susceptible to error. Each team member may check in and check out of the procedure at any time, provided their profile is uploaded to the system preoperatively. Although no final product cost can be estimated at this time, use of the HUB across multiple surgical specialties may reduce the additional cost per case. Ultimately, surgical safety interventions endeavor to reduce morbidity and mortality. The logical next step is to apply the HUB to a larger series of cardiac surgical procedures to determine whether the HUB achieves this goal. Corresponding Author: Christopher L. Tarola, MD, MPH, Veterans Affairs Boston Healthcare System, Division Cardiac Surgery, 1400 VFW Pkwy, Mail Code 112, West Roxbury, MA 02132 (christopher.tarola@londonhospitals.ca). Author Contributions: Drs Tarola and Zenati had full access to all the data in the study and take responsibility for the integrity of the data and the accuracy of the data analysis. Concept and design: Tarola, Haime, Leissner, Zenati. Drafting of the manuscript: Tarola, Haime, Gabany, Zenati. Critical revision of the manuscript for important intellectual content: Quin, Haime, Taylor, Leissner, Zenati. Administrative, technical, or material support: Haime, Gabany, Taylor, Leissner, Zenati. Study supervision: Quin, Gabany, Zenati. Conflict of Interest Disclosures: Dr Zenati is the inventor of the original intellectual property, the HUB System, a communication management system that is licensed by Harvard University to Surgical Safety Solutions LLC. Dr Zenati additionally owns founder’s shares. No other disclosures are reported. Additional Contributions: We thank Annette Phillips, RN, Veterans Affairs Boston Healthcare System, West Roxbury, Massachusetts, for her clerical assistance and Michael Grumbine of 3si Surgical Safety Solutions (http://www.3sisystems.com) for technical assistance in HUB operations. Neither party received financial compensation for their efforts.